Under Windows 10, users suddenly are no longer able to load apps from the Microsoft Store. Each attempt ends with error code 0x87AF000B. The message shown below will be displayed is not really helpful. It just says that something unexpected has occurred. Searching the web reveals many hits in Microsoft Answers (see here). The proposed fixes like resetting the store using wsreset.exe or reset Windows Update (see here) won’t help. 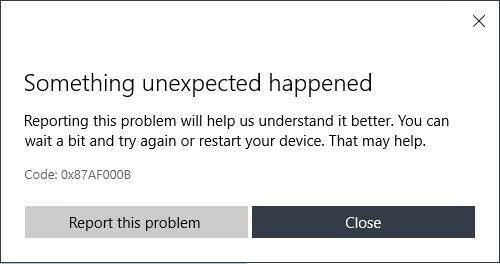 Also restarting Windows 10, as proposed within the error notification shown above isn’t a fix, as you can read here. What exactly does the error code stand for? The first question I ask in this case is what error code 0x87AF000B stands for. According to this web page 0x87AF000B stands for an SQLite error SQLITE_E_CORRUPT, ‚The database disk image is malformed‘. The error must be interpreted in such a way that Windows uses SQLite to write and read app data into a database. If this database is damaged, the operations no longer work and the error occurs. The error can occur if an operation on the database is not properly completed, for example, due to the crash of an app. It is possible to repair the SQLite database with suitable tools. The approaches are described in this article, as well as here, and here you will find additional information. However, this approach is likely to fail in practice because neither the database repair tool nor the location of the database is known. How can you, as a normal user, create a new SQLITE database for the store? 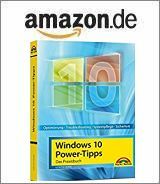 Since this database is administered on a user-specific basis under Windows 10, there is a solution. What you can try is to create a new local user profile and log in under this profile. Then start the Windows Store as an app and connect the app to the Microsoft account. These steps force to create a new SQLite database for the account. If the store download works again, it’s clear that the old database in the user profile is corrupted. In this case, I would delete the old user account via the settings app or the control panel and create a new one. This resets the local profile. This approach was mentioned as successful within this forum thread. This entry was posted in issue, Windows and tagged error 0x87AF000B, Store, Windows 10. Bookmark the permalink.